For a complete set of the gadgets used for electrical work, take a look at the 28-Piece Electrician Tool Set by Klein Tools. 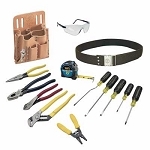 There is a variety of tools available with this kit, offering the ability to work on a multitude of applications in the electrician’s market. A pouch comes with this tool set that can fit everything comfortably, keeping all of the electrical equipment at the ready and transportable in no time. Worried about a long work shift? Then feel free to enjoy the cushioned-grip handles that reduce fatigue from extended use. 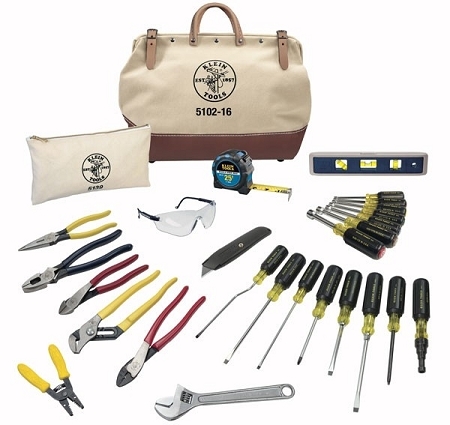 You can’t go wrong with the Klein Tools 28-Piece Electrician Tool Set.